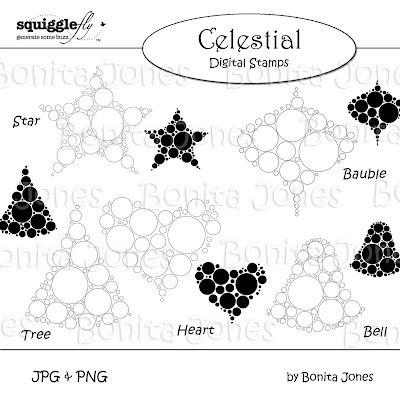 Introducing Celestial my new stamp set for Squigglefly (Dec 5th). The range includes a Star, Tree, Bell, Bauble and Heart in both lined and solid versions (JPG & PNG). Perfect for colouring or to use as a brush. I've used the solid bauble image to make a brush in Photoshop. Then I stamped the bauble in three different sizes and colours. I printed them onto 'Misty' paper (from Lindcraft), cut out and popped them up with foam stickies. Add a bit of black Artline pen. Volia! A quick and simple card. Quick Photoshop tip: If you find it hard to choose colours (like me) stamp your image onto a transparent layer first. Then add a 'fill' layer above the stamp and select 'create clipping mask'. You can quickly change the colour of the 'fill' layer to see which colour fits you existing scheme. This method works great with digital paper too. Hope this helps! This is a great card! I love the baubles!